Moreover Nannochloropsis was shown to be able to store energy and carbon in polymers of β-1,3- and β-1,6-linked glucose called chrysolaminarins, which are very common storage sugars among the neighbouring species of microalgae. Since the genes involved in this path have been identified, they’re expression has been studied in order to better understand the metabolic fluxes in Nannochloropsis in different growth conditions. Due to the exemplary lipid production of Nannochloropsis cultures, the genes related to lipid biosynthesis and degradation have attracted a lot of attention. A comparative analysis of Nannochloropsis genes in relation to the genes of various other algae of the red, brown and green groups has shown that Nannochloropsis has an expanded repertoire of some of the genes involved in TAG assembly. Most interestingly a high number of tag lipases (52 in N. oceanica) was found in Nannochloropsis. If you look at the information provided for each gene in this portal you will find that many of the predicted TAG lipases belong to a gene family which is exclusive to Nannochloropsis. TAG lipases can effect lipid metabolism in many ways through TAG degradation and lipid remodelling. Also in this case further studies will probably enlighten the function of these genes are their rule in Nannochloropsis metabolism. Analysis of the genomic data of Nannochloropsis suggested that in both the two species regulatory RNAs are present and in particular miRNA. We also found genes essential for the RNA silencing process. These findings open interesting perspectives for studying Nannochloropsis using gene knock-down techniques based on the transient expression of siRNA. Among the puzzling questions that remain open there are the capability of Nannochloropsis to reproduce sexually, the presence of a circadian regulation and the existence of motile structures in some steps of its life cycle. While evidence of sexual reproduction has never been observed in Nannochloropsis, we found a set of genes important for meiosis and DNA recombination that are not only conserved but also actively expressed. While shooting pictures of Nannochloropsis lipid droplets at the confocal microscopy, we found evidence of the presence of a red eye-spot in the cells, located outside of the chloroplast. We dont’t know weather this structure could be assigned as a blu-light sensor, nevertheless proteins which are orthologs of known blue light sensors were found in the genomes of Nannochloropsis, opening up the perspective of the presence of a circadian regulation of the growth and metabolic activity of this alga. Such a possibility would not be in contrast with some observations collected in outdoor cultivation plants. Finally we found in the genome a set of proteins, which were highly similar to proteins that have been experimentally assigned to motile structures in Chlamydomonas. Also in these case the predicted genes were expressed in our experimental conditions. Evidence is definitively not enough to drive any conclusion, but certainly it rises a motivated curiosity about the possible function of these proteins..
A summary of the informations obtained after the sequencing of Nannochloropsis genomes is also reported on Wikipedia! 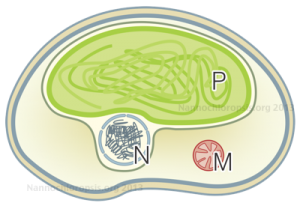 Pan, K. et al.”Nuclear monoploidy and sexual propagation of Nannochloropsis oceanica (Eustigmatophyceae) as revealed by its genome sequence.” Journal of Phycology (2011), 47(6), pp.1425–1432.